He promises there are more possibilities than ever to heal our bodies and our lives, live abundantly, and bring peace to the nations of the world. Today we are introducing a game-changing road map you can follow to get there. If ever there was a different breed of cat in the spiritual world, it’s Gregg Braden. While many scholars were claiming the world would end on December 21, 2012, Gregg refused to jump on the “doom and gloom” bandwagon. Instead, he said just the opposite. He believed 2012 was the beginning of a magical time of rebirth and awakening. Over the past decade, Gregg published four programs with Nightingale-Conant that present compelling evidence that allows us to make sense of the changes that are occurring now and use a “forgotten wisdom” to transform our lives as we move beyond 2012. But, there’s A LOT of information in those programs. And this is a time for action. So, we decided to pore over Gregg’s programs to pull out the gold nuggets of his research and wisdom and put them all into ONE program. The result is a masterpiece that reveals a clear road map to the breakthroughs, solutions, and even miracles you’re looking for. This is an exclusive and exciting offer from Nightingale-Conant to give you a practical course of action for healthy, joyful, and abundant living in today’s rapidly changing world. Whether you’re a devoted Gregg fan or a rookie, the wisdom you’ll gain from this unique collection will change the way you think about most everything in your life moving forward! What happens when you have this new wisdom? It gives new meaning to every moment of your life. And, as a result, it transforms your life forever, from the inside out. That's because the relationship between what happens inside and outside of your body is a science. What I mean by science is that the result is consistent, predictable, and repeatable. Ancient traditions, esoteric traditions, native shamans, and indigenous healers have known about this relationship since the beginning of time. You'll let go of old constructs that no longer work, and you'll apply your skills and experience in a more empowering and uplifting way. Your heart, mind, and body will be in coherence, and you'll experience a "knowing" as never before. You'll be able to apply in your daily life the principles you claim to be true in your heart and mind, and you'll even help bring peace to the nations of our world. You'll have a compass to guide each choice and decision you make throughout the day. You'll see that you have countless possibilities for a healthy, vibrant, and bright future. You'll be able to heal your body. The gap will close between the world you live in now and the one you dream of. Think it will be hard to grasp this wisdom? I promise you that it won't be. That's because you'll be remembering a truth we knew long ago, in our hearts, if not in our heads. Our most cherished traditions tell us that there was a time in our ancient history when "the wisdom of the heavens" was given to the family of man. We were told how we relate to God and the forces of creation, the world around us, and one another. But then the chain of knowledge was broken, and many of the traditions that had been held so dear were lost or forgotten. And without a map to follow, humankind started walking a new path. For nearly three decades, Gregg Braden has journeyed into the remote mountain villages, monasteries, and temples of Tibet, Peru, and Egypt to study ancient texts and spiritual traditions to fix the broken chain of knowledge. And in four amazing Nightingale-Conant programs, Gregg took us on a magnificent journey, sharing different aspects of this forgotten wisdom with our customers. Each of his programs revealed in-depth details about the truth of who we are and how we can use ancient wisdom to heal on every level. We created this collection now because our ancestors accurately predicted that we would face extraordinary changes as we enter the New World Age, which began on December 21, 2012. So it is particularly important for us to understand and apply this wisdom right now. In Prayer, Prophecy, and the Promise of a New World, Nightingale-Conant distilled Gregg's decades of study, expeditions, teachings, and recordings into a meaningful and practical course of action for living in today's world. Plus, we included a brand-new DVD in which Gregg shares his most recent advice for thriving in 2014 and beyond. It's a powerful compilation that includes fascinating scientific research, information from ancient texts, personal stories, exercises, and tools you can use in the real world. I believe it will knock your socks off! Prayer, Prophecy, and the Promise of a New World puts the best of Gregg's findings in ONE place so that you have a map like the one the ancients had. Now you'll have the same wisdom our ancestors had to heal their bodies and their lives, and maintain peace in their communities — even during times of enormous change. And this new wisdom will be due in large part to Gregg Braden's tireless efforts over the past 27 years. If you're wondering why anyone would dedicate so much of his life to uncovering the secrets from our past and relating them to modern science, the answer lies deep in Gregg Braden's heart. In the years leading up to the Cold War, Gregg found himself working in an industry he didn't believe in. He was the Senior Computer Systems Designer for launch pad software for missiles. One day, the U.S. and Russia came very close to unleashing nuclear weapons on civilian populations. It was an unthinkable act that drove Gregg on a pilgrimage to Egypt to gain perspective. If I died right now and I looked back at everything that I have accomplished, would I feel my life was complete? The answer was a resounding "No! I can contribute more!" And then, another question popped into his head: "What would it take to say yes?" Gregg was certain there was a dissonance between the world we lived in and the world that he believed was possible. So he decided in that moment to find a way to narrow that gap. Gregg continues on his mission to this day, always seeking, studying, and learning so he can share his findings with others. He knows that as we continue to glean the deepest truths of our relationships with our bodies, one another, and the earth, then our course for healing, abundance, and peace becomes more and more clear. Yes! I'm ready for a new wisdom that allows me to heal my life on every level! I can ORDER NOW and SAVE $50! Gregg's expertise in merging timeless secrets with the best science of today is now legendary. Today, he is an internationally acclaimed speaker and New York Times bestselling author because of his rare ability to apply ancient wisdom and leading-edge science to the real world. The bestselling programs we've produced with Gregg over the past 10 years tell an unfolding story about our past, a forgotten wisdom, and how to make sense of the changes that are currently occurring in the world. A lost mode of prayer (a nonverbal language) that awakens your power to heal your life on every level. How you can interact consciously and effectively with the forces of creation. Specific steps you can take to transform the miracles in your imagination into what is real in your life. Why how we meet today's challenges will set the course for everything from our personal and collective lives to the future of civilization itself. In essence, Gregg's programs show you how to use "the wisdom of the heavens" to transform your life forever. The key is to apply in your daily life the spiritual principles that you believe in your heart. And that's exactly what Prayer, Prophecy, and the Promise of a New World: The Best of Gregg Braden Library helps you experience. Whether you're a beginner on this path or a seasoned traveler, this collection of highlights gives you actionable tools and a practical course of action for moving forward with power, excitement, and a clear purpose. If you have ever feared that our best days might be behind us, Prayer, Prophecy, and the Promise of a New World sheds light on the many possibilities that exist for a healthy, vibrant, and bright future. It sets the course for peace, abundance, and prosperity in the New World. Make your prayers far more effective. Learn a nonreligious, nondenominational "lost mode of prayer" that is more powerful than words. People have used this form of prayer to melt away tumors in mere minutes, end a three-year drought in a day, and avert a war that appeared to be inevitable. Just imagine all the ways you can use it. Become more aware of the moment-to-moment dialogue you are having with the world around you so that this ongoing "conversation" starts coming from your heart, not your head. Your heart is where limitations and restrictions don't exist, and joy, happiness, and fulfillment are available at any moment. It's where magic happens. Get heart and mind coherence so you can consciously speak "the language of God." You'll learn how to change your perspective from one of actively pursuing your life's goals to one in which you attract them to you. This powerful heart/mind/world connection will soon become a cornerstone for science. The remarkable discovery of the Shroud of Turin. You'll discover what you are truly capable of, and it will blow your mind! The powerful message that was left 5,125 years ago that was meant precisely for us today. You'll learn what the ancient texts said would happen at this time and the action plan they offered for how to meet our current challenges. See why you are never locked into a particular outcome. If you don't like the road you're on, you can make a quantum leap to the road that is leading where you want to go. You'll learn how to do that so you can claim the experiences you want for yourself and our world. Discover why old notions like "Survival of the Fittest" and "us vs. them" are false. Once you replace these obsolete notions with scientifically proven facts, your life will be transformed in surprising and meaningful ways. Discover the blueprint to changing the conditions that no longer serve you. In order to prosper, people who are thriving right now have let go of the old constructs they used five or 10 years ago. They're asking new questions and coming up with new solutions. Now you can join them. Harness the power that is at your fingertips. We are in the greatest shift of power, wealth, and resources that has ever occurred. Our most profound danger is the thinking that prevents the solutions from showing up in our lives. You'll learn how to break free of the ancient trap that keeps you stuck in the thinking of the past and see that each moment truly offers many wonderful possibilities. hits the road of the real world! 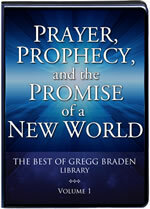 Prayer, Prophecy, and the Promise of a New World is a meticulously arranged and artfully compiled library designed to present forgotten wisdom, modern scientific discoveries, and fresh ideas and concepts that appeal to Braden old-timers and beginners alike. What I really love about Gregg's work is that there's no guesswork or theory. Gregg is a scientist and a realist at heart, so all of his programs rest entirely on the latest discoveries in science, spiritual texts, and experience. Plus, his work bridges spirituality and modern science, instead of looking at them as separate entities. This is the kind of thinking we need to help us transform our lives now and in the coming years. For these reasons, it was a real joy for us to compile Prayer, Prophecy, and the Promise of a New World. The collection is large because we wanted to make sure no critical pieces were left out of the puzzle. At the same time, we made a concentrated effort to ensure relevancy and consistency. Above all else, we wanted to make sure that the library gives you practical tools that you can easily apply in your day-to-day life. We all need tools to help us move forward when we get stuck. Tools that help us think differently and stay aligned with the Divine. This collection gives you those tools and much, much more. The Ancient Blueprint for Powerful Prayer – see how an ancient prayer for healing and peace works, and get instructions for how to use this type of prayer to transform your life. Listening to the Silent Language of God – examine several prayers, and learn how to create your own effective prayer. Reflecting the World Within – look at what is going on inside of you, and learn how to change it. Understanding the Divine Matrix – gain insight into why your mind is the matrix for what shows up in your life, and learn how to use a different language to change what you see in the world. The Mystery of the Great Isaiah Scroll – find out why this is the most important archeological find of the 20th century and the implications it has on your life today. The Most Powerful Force in Our Universe – explore why beliefs are so powerful and why changing limiting beliefs is much easier than you think. Conscious Creation – learn specific, step-by-step instructions for creating the conditions you want in your life. Patterns, Cycles, and Time Codes – learn how you can look at patterns, cycles, and time codes to predict and change your future. The Great Secrets of Our Past – explore a compelling theory that can change your life forever. How to Thrive in the New World (brand-new DVD) – discover the old scientific notions that have created many of the problems we are dealing with today and the key to transcending those challenges. I have little doubt that once you have listened to Prayer, Prophecy, and the Promise of a New World and start applying the techniques that are suggested, you'll start seeing big changes in your life. More importantly, you'll feel excited about the future and all the possibilities that are ahead. While I am convinced that this is a program you will definitely want to make part of your permanent library, I don't want you to take my word for it. Simply click on the link below and you'll receive the entire Prayer, Prophecy, and the Promise of a New World Library, which includes 10 CDs and a brand-new DVD (details below). You'll also receive a RISK-FREE 30-day guarantee. If you don't find it makes you more excited about today and the future, simply return the program for a full refund. No questions asked. Are you ready to let go of old ways of thinking and being so that you can thrive in the New World? Don't waste another second being stuck or limited by old ideas. Click on the link below, then celebrate knowing a wonderful future is just ahead. Soon your mind will be kinder to you, and you will never see the world the same way again! YES, I'm ready for a new wisdom that allows me to heal my life on every level! If this program doesn't help me release old beliefs that no longer serve me, or if I'm dissatisfied with the program for any reason in the next 30 days, I will return the program for a full refund. No questions asked. at a limited-time special price! Here's your first chance to gain access to Gregg Braden's remarkable expertise and knowledge in ONE place. Whether you've admired Gregg's work for some time or are new to his wisdom, you will appreciate how the information from his recordings (audio and new DVD) has been compiled. It tells a compelling story about our past, a forgotten wisdom, and how to make sense of the changes that are occurring in the world now. The story ends with a practical course of action for healthy, joyful, and abundant living in the New World. By applying the tools Gregg shares with you, you'll break free of the ancient trap that keeps you stuck in the thinking of the past. You'll learn to transform your understanding of how to get well and stay well... find simple solutions to the challenges you face... align yourself with a new way of thinking and being in the world... effect positive global change... and MORE! And you'll have a compass to guide your every choice and decision in life because as Gregg says, "When the facts are clear, the choices become obvious!" Who are we in the universe and what is our role? What formed the image on the shroud? How 9/11 fell into a larger cycle: Could we have known? Gregg Braden is internationally renowned as a pioneer in bridging science, ancient wisdom, and the real world. Following a successful career as a computer geologist for Phillips Petroleum during the 1970s energy crisis, he worked as a Senior Computer Systems Designer with Martin Marietta Defense Systems during the final years of the Cold War. In 1991, he became the first Technical Operations Manager for Cisco Systems. For more than 27 years Gregg has explored high mountain villages, remote monasteries, and forgotten texts to merge their timeless secrets with the best science of today. His discoveries are now shared in 33 countries and 38 languages through paradigm-inspiring audio programs and books, including a textbook for college-level courses exploring new discoveries in science and our relationship to the world. Gregg’s work has been shared on every continent of the world, and in recent years he has presented his seminars and trainings to Fortune 500 companies, the U.S. military, and international businesses and is now featured in media specials on the History Channel, the Discovery Channel, National Geographic, ABC, and NBC.